The WCRI conference, now in its 32nd year, is a leading workers’ compensation forum for policymakers, employers, labor advocates, insurance executives, health care organizations, claims managers, researchers, and others. Although WCRI does not take positions or make recommendations, we felt it important to provide a venue for those attending our conference to learn more about this topic from a diverse and balanced set of speakers. The ability for employers to opt out of state workers’ compensation systems has been getting a lot of attention as of late. In an effort to provide a forum for this topic, the Workers’ Compensation Research Institute (WCRI) added two panels on opt out to their annual conference (March 10-11, 2016) at the Westin Copley Place Hotel in Boston, MA. “Although WCRI does not take positions or make recommendations, we felt it important to provide a venue for those attending our conference to learn more about this topic from a diverse and balanced set of speakers,” said John Ruser, WCRI president and CEO. For the second panel, WCRI has invited a balanced and diverse group of individuals to share their perspectives on opt out. Each of the panelists below brings a different viewpoint. Elizabeth Bailey, vice president of workers' compensation & safety at Waffle House, Inc. The WCRI conference, now in its 32nd year, is a leading workers’ compensation forum for policymakers, employers, labor advocates, insurance executives, health care organizations, claims managers, researchers, and others. Conference participants will leave with new insights, valuable networking contacts, and a better understanding of key issues in today’s competitive environment. To learn more or to register, visit http://www.wcrinet.org/conference.html. 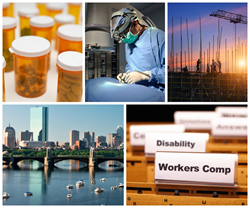 The Cambridge-based WCRI is an independent, non-partisan research institute that is recognized as a leader in providing high quality, objective information about public policy issues involving workers' compensation systems.